Parliament extended the mandate to send military troops abroad for 13 months during their first convention Saturday of the new legislative year after a one and a half month long recess. 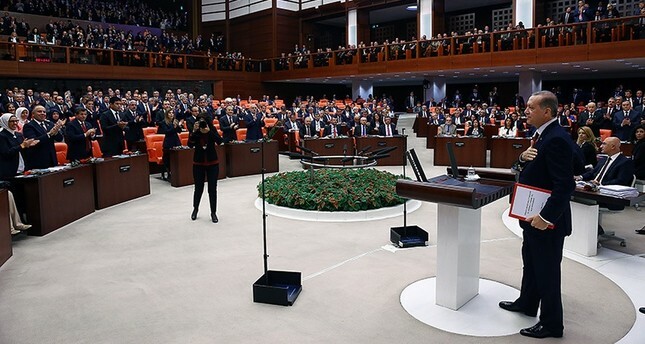 The bill passed easily on the first day of the new session of parliament with support from the ruling Justice and Development Party (AKP), main opposition Republican People's Party (CHP) and Nationalist Movement Party (MHP). Only the Peoples' Democratic Party (HDP) voted against. The motion also allows foreign forces usage to Turkish airbases and Turkish territory against the same threats, including Daish, the PKK and its Syrian affiliate, the Democratic Union Party (PYD) and its People's Protection Units (YPG) militia. Parliament Speaker Ismail Kahraman said that making a simple, civilian, democratic, libertarian and individual-centered new constitution is a top priority for this legislative year. In his address, President Recep Tayyip Erdoğan said that he will support Parliament's efforts for a new constitution and change its bylaws. He stated that he is willing to leave behind the "pointless" arguments with the opposition for the upcoming period, and urged the opposition to end the attacks on the presidency. Both Kahraman and Erdoğan thanked the members of the parliament for their honorable stance during the July 15 coup attempt, in which Gülenist Terror Group (FETÖ) linked officers went as far as bombing the complex while deputies were inside to show solidarity. Speaking on the problems in Iraq and Syria, Erdoğan said that Daish is not the cause, but the result of ongoing problems in Iraq and Syria, an argument used by those who have plans there. "It is not reasonable for a country with a 22 million pre-war population could not be cleansed from Daish's foreign fighters estimated around 10,000 for over five years. The same goes for Iraq. It is obvious that problem does not stem from approximately 10,000 foreign fighters," Erdoğan said. Erdoğan also criticized the U.S. for supporting the YPG, the Syrian wing of PKK terror organization, to counter another terrorist group. "Arguments of those who try to confront Daish with YPG have been rendered useless with Euphrates Shield operation," Erdoğan said, adding that Turkey's efforts prove that local forces can defeat Daish when they receive necessary support. "We have witnessed serious contradiction in the policies of the U.S. in its policies towards our region especially in this latest period. While one part of the American administration insists on carrying out joint work with the PKK/PYD-YPG terror organization in Syria and Iraq, the other part is trying to follow policies closer to our sensitivities. We will try to solve this problem, which is understood to have originated from presidential elections in U.S., without bringing permanent damage to the vital interests of our country," Erdoğan said, adding that the 9/11 bill recently appointed by the Congress against Saudi Arabia is a clear violation of the universal principles of law. The president described the Operation Euphrates Shield as a realization of Turkey's long-voiced stance to create a safe zone in northern Syria to curb the refugee influx, and said that both the terror and refugee issues can be resolved when Syrian territory becomes safe step by step. "When we first entered Jarablus, there were 2,000 people, now it's close to 40,000, which means the people of Jarablus returned to their own land. We did not face any objections in principle for this project we have defended for years, but we could not find concrete support. The terror corridor that was tried to be establish in our southern borders and intensifying actions of PKK and Daish in our country obliged us introduce this project with our own means," Erdoğan said. The president urged Arab and Turkmen elements of the region to be supported for the upcoming operation to liberate Mosul from Daish, and warned against the usage of Shiite militias and PKK's offshoots, which may provoke ethnic and religious tensions. Criticizing the stance of the European Union towards the ongoing humanitarian crisis due to refugee influx, Erdoğan accused the 28-nation-bloc of not keeping its promises on the migrant deal in May. "Visa exemption for Turkish citizens needs to come into effect within this month. When we look at the statements coming from the union, we see that a vital issue for Turkey like the war on terror is attempted to be turned into a precondition for the process. I'm speaking openly; they are not keeping their promises. They can think for themselves," Erdoğan said. "If the EU is going to make Turkey a full member, we are ready. But they should know that we have came to the end of the game. It's their choice to continue the path with or without Turkey. They should not hold us responsible." Under a March deal, Turks were to gain visa-free travel in exchange for Ankara helping reduce the flow of migrants to Europe. Turkey's bid to join the EU dates back to the 1960s with formal talks starting in 2005. So far, only 16 chapters of the 35 chapter accession process have been opened for Turkey. "The fact that our country has been kept waiting at the door for 53 years shows your (the EU's) opinion towards us," Erdoğan added.